Template preparation reagents for preparing and multiplexing SMRTbell library templates for long-read sequencing on the PacBio Sequel System. Quickly create libraries for Single Molecule, Real Time (SMRT) Sequencing with our template preparation kits. DNA is treated to ensure the removal of any DNA damage, and ends are repaired and circularized with the addition of SMRTbell adapters. The result is a circularized template, called a SMRTbell library. SMRTbell templates provide a segment of single-stranded DNA to which a sequencing primer is annealed. A polymerase is bound to a primer-annealed template and the complex is ready to be loaded onto SMRT Cells. Prepare SMRTbell libraries for all insert sizes from 500 bp to >50 kb with 4 hours library construction time. The SMRTbell Express Template Prep Kit 2.0 supports insert sizes from 500 bp to >50 kb. This kit employs a single-tube, addition-only strategy to minimize handling-induced DNA damage for library generation in 4 hours. We recommend this kit for large-insert gDNA libraries for de novo whole genome sequencing, and multiplexed microbial genome sequencing. Currently, the kit has not been optimized for preparing templates for Iso-Seq analysis, and is not recommended for this application. The kit is designed for diffusion loading only and is currently only compatible with the Sequel System. Each kit contains sufficient reagents to prepare 18, 48, and 96 reactions to respectively support large-insert libraries, microbial multiplexing, and amplicon sequencing. Note: Amplicon solutions accompanying this kit will be available in Summer 2019. Quickly prepare >15 kb long-insert SMRTbell libraries for the Sequel System. The SMRTbell Express Template Prep Kit has an approximate 3-hour hands on workflow from sheared gDNA to SMRTbell templates. The kit is optimized for generating size-selected, long-insert libraries (>15 kb and >30 kb size-selection) for use with diffusion loading on the Sequel System. For amplicon sequencing and libraries with templates averaging <15 kb, including libraries for Iso-Seq analysis we recommend the SMRTbell Template Prep Kit 1.0-SPv3 (PN: 100-991-900). Reagents quantities support the preparation of 16 SMRTbell libraries. Note: This product has been discontinued and will be made available while supplies last. Prepare primer-annealed, symmetric SMRTbell libraries for insert sizes ranging from 500 bp to over 20 kb. The SMRTbell Template Prep Kit 1.0-SPv3 bundle contains the reagents, including sequencing primer, needed to prepare SMRTbell libraries for the Sequel System. This kit is recommended for amplicons, genomic libraries, Iso-Seq analysis, and use with any of the barcoding products for multiplexing. Reagent quantities support the preparation of 10 SMRTbell libraries. For bulk packaging, please contact your local field application scientist or sales representative. Note: Sequencing Primer v3 (PN: 100-970-100) also sold separately. Magnetic beads specifically formulated for the removal of 1) small template fragments during the template preparation or 2) excess polymerase and primer from polymerase-bound SMRTbell complexes. AMPure PB beads are used for 1) DNA cleanup and purification during various stages in the SMRTbell library template preparation workflow and 2) clean up of excess polymerase and primer from polymerase-bound SMRTbell complexes. Reagent quantity supplied at 5 mL volume. Elution Buffer for those extra clean-up steps especially when when handling multiple samples for multiplexed sequencing runs. The Elution Buffer (50 mL) is used with the SMRTbell library template preparation and barcoding associated kits for workflows requiring additional elution buffer and AMPure clean-up steps. Reagent quantity supplied at 50 mL volume. Sequence multiple samples on the same SMRT Cell to increase throughput and enhance the efficiency of your research. Multiplexing is supported with three barcoding options providing flexibility to incorporate unique sample identifiers during target amplification or library preparation. Add barcoded primers to amplicons during (1) PCR through either target-specific primers with incorporated barcodes or (2) a two-step PCR using barcoded universal primers. Add barcodes to samples with (3) ligation of barcoded SMRTbell adapters to template. Learn more about Multiplexing, including information on barcode sequences compatible with SMRT Sequencing. Two sets of 8 barcoded overhang adapters for multiplexing SMRTbell libraries in applications such as multiplexing for microbial whole genome sequencing when using the Express 2.0 product family. The Barcoded Overhang Adapter Kit – 8A/8B are used in conjuntion with the SMRTbell Express Template Prep Kit 2.0 (PN 100-938-900) for multiplexed microbial multiplexing sequencing. The kits can be combined to perform up to 16-plex of pooled microbial genomes. We recommend pooling up to 30 MB of total microbial genomes per SMRT Cell to obtain highly contiguous microbial genome assemblies, and up to 40 MB for advanced users.The specific barcodes contained in this kit are as follows for the respective kits:8A: bc1001, bc1002, bc1003, bc1008, bc1009, bc1010, bc1011, bc1012. 8B: bc1015, bc1016, bc1017, bc1018, bc1019, bc1020, bc1021, bc1022. Each kit contains 8 barcoded overhang adapters with sufficient reagents to perform 6 ligation reactions for each barcode to support multiplexed microbial genome sequencing, or 12 reactions for amplicon sequencing. Two sets of 8 barcoded adapters for multiplexing SMRTbell libraries in applications such as multiplexing for microbial whole genome sequencing. The Barcoded Adapter Kit- 8A (PN: 101-081-300) and Barcoded Adapter Kit- 8B (PN: 101-081-400) each contain 8 blunt-ended barcoded adapters for ligating barcoded SMRTbell adapters onto gDNA, and Sequencing Primer v4 for diffusion loading. Using both kits (sold separately), up to 16 SMRTbell libraries can be pooled and loaded onto the Sequel System.Up to 30 Mb of microbial genomes can be multiplexed on a single SMRT Cell. For high-performing centers with large-volume microbial sequencing and optimized workflows, up to 40 Mb of microbial genomes can be accommodated.Recommended for use with SMRTbell Template Prep Kit 1.0-SPv3 (PN: 100-991-900) and diffusion loading. Each kit includes 8 Barcoded Adapter tubes containing reagent quantities that support 6 ligation reactions per barcode. Note: These products have been discontinued and will be made available while supplies last. We recommend using the Barcoded Overhang Adapter Kits 8A/8B (PN 101-628-400/500) with SMRTbell Express Template Prep Kit 2.0 (PN 100-938-900) for multiplexed microbial genome sequencing applications. Each kit sold separately. A set of 96 barcoded primer pairs for multiplexing amplicons containing universal sequence tags. The Barcoded Universal F/R Primers Plate -96 contains a 96-well plate of barcoded forward and reverse primers. Each well on the plate contains a unique primer pair consisting of a forward and reverse primer of the same barcode. 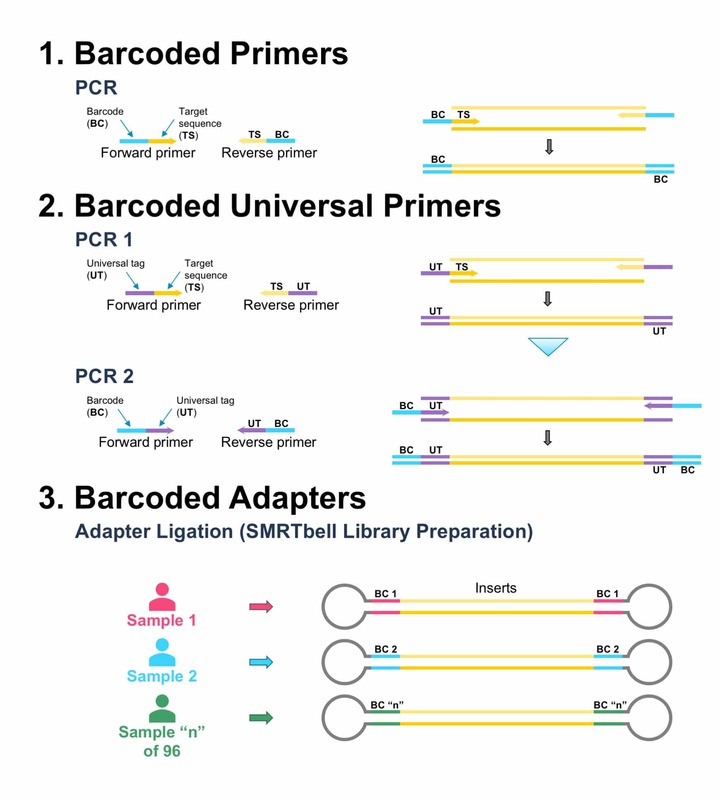 These barcode sequences are incorporated with amplicons via a 2-step PCR process where primer pairs designed to specific targets have also been tagged with a universal sequence compatible with the Barcoded Universal F/R Primers Plate - 96. Subsequently, standard SMRTbell adapters are ligated to these barcoded amplicons. Reagent quantities support a single use of each of the 96 primers pairs in library preparations. A set of 96 barcoded SMRTbell adapters for multiplexing amplicons through ligation to generate SMRTbell libraries and do not require modifications to existing, pre-designed PCR primers. The SMRTbell Barcoded Adapter Complete Prep Kit -96 includes the SMRTbell Barcoded Adapter Prep Kit (PN: 100-465-800) and Barcoded Adapter Plate – 96 (PN: 100-466-000). These adapters are ligated directly to amplicons and pooled for damage repair using the SMRTbell Damage Repair Kit - SPv3 (PN:100-992-200, sold separately) prior to sequencing. Note: Kit components also sold separately. Perform DNA damage repair, Exonuclease III and VII treatments, and primer annealing of SMRTbell libraries prepared with SMRTbell barcoded adapters. The SMRTbell Damage Repair Kit-SPv3 contains reagent supplies to perform DNA Damage Repair, Exonuclease III and VII treatments, and primer annealing of SMRTbell libraries using Sequencing primer v3 for insert sizes ranging from 500 bp to over 20 kb. Recommended for use with the SMRTbell Barcoded Adapter Complete Prep Kit (PN: 100-514-900) to generate primer-annealed SMRTbell libraries ready for polymerase binding. Can also be used for extra DNA damage repair of template. Reagent quantities support 10 library preparations. For more information about how our Sequel System consumables can accelerate your research, contact us.